The yacht named after a former owner, Princess Grace, now cruising the Galapagos via Quasar Expeditions. Pinch me. I must be double dreaming. I am basking on the M/Y Grace, the yacht given by Onassis to Grace Kelly when she married Prince Rainier of Monaco, the yacht the royal couple honeymooned on. 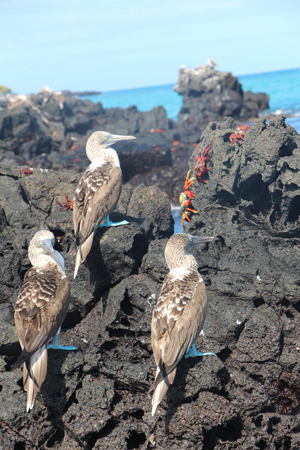 In every direction I see islands of the Galapagos, one of the world’s great destinations, and a spectacular part of Ecuador, the small enticing country that also shares the Andes and Amazon with travelers that love culture and nature. Yes, I was dreaming — but dreaming of reality — of the trip I finished yesterday. I am swimming in joyful recollections. 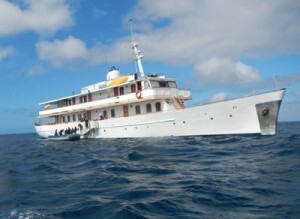 The teak and mahogany yacht for the voyage previously entertained Winston Churchill, served valiantly in WWII, and was a moving playground for the wealthy before Quasar Expeditions turned it into a romantic nine-suite vehicle for travelers seeking the extraordinary, far from the Mediterranean and Monaco. 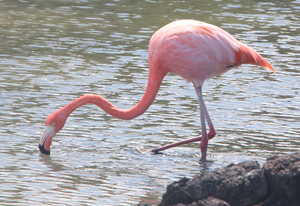 A flamingo looking for shrimp in a Galapagos lagoon. 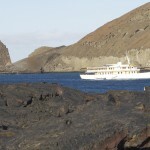 Onboard our week-long cruise of the southern Galapagos, there was a family of five, a couple in their 30s on their honeymoon, and another couple in their 30s who got engaged while on the paradisical Gardner beach of Santa Cruz Island. Just a few days later with accumulated Grace and Galapagos memories, the two medical professionals actually had the Captain marry them our last night, for a very spontaneous elopement not on the itinerary. Was it the almost-full moon? The fresh lobster dinner? All the laughter of the guests, now friends, remembering favorite moments of the trip? A desire to weave the trip’s joys more permanently into life’s quilt? A love that deepened in a remarkable place? The couple added yet another chapter to the romance and legacy of the yacht. Many additional cherished memories filled my well-named memory chip of photos from our daily hiking and snorkeling expeditions on different islands with up close views of flamingos, penguins, iguanas, blue footed boobies, mating comarents, newborn sea lions, newly hatched albatrosses, and the finches that helped Darwin form his revolutionary theories about the evolution of life. It was a privilege to be able to move through the raw and wild movements of nature in parts of the islands without human habitation, but two of my favorite moments came when I stayed in one place and the animals came to me. On our last snorkel, led by the Captain beneath the striking monolith of Pinnacle Rock, I floated gently and just felt awe at the schools of fish shimmering around me, and the shapes of the immersed rocks with bright colored algae and aneomones. Suddenly two penguins darted toward me, performed twirling twists right in front of me and zoomed off. Then back again. I laughed with glee and was glad my prescription mask didn’t leak when I smiled grandly. The penguins continued to dart around our little band of bipeds for ten minutes and even brushed against one snorkeler who said the bird felt soft. A different afternoon on the post card -looking Gardner Beach, I sat in the powder-soft organic sand, while Galapagos penguins were swimming in the waters that mingled turquoises and azures. 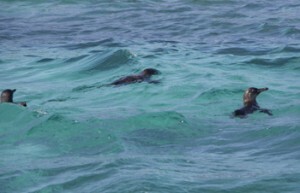 A baby sea lion waddled toward me sniffing like a puppy dog. Somewhere else on the beach, a delightful couple (after several years together) were getting engaged to be married, while the rest of us were engaged with different wildlife. Six hundred miles of Pacific Ocean from the mainland of Ecuador, surrounded by the life force, I think we were all glad to be able to say “I do” to the Galapagos with Grace.